Longstanding smartphone market leader in Southeast Asia, Samsung Electronics has been dethroned. According to latest data by the International Data Cooperation (IDC), Chinese smartphone manufacturers, Huawei, OPPO and Vivo have collectively edged out the Korean smartphone giant in 2017. Last year, Samsung shipped a total of 29.3 million smartphones, garnering a market share of around 29.1 percent. The trifecta of Chinese smartphones shipped half a million more smartphones gaining a slightly higher market share of 29.6 percent. Of the three, Vivo smartphones recorded the highest year-on-year change in terms of market share and shipment volumes. The nine-year-old smartphone manufacturer more than doubled its shipment volume from 3.3 million in 2016 to 7.2 million in 2017. Its market share saw a whopping increase of 225 percent from 3.2 percent in 2016 to 7.2 percent in 2017. Total smartphone shipments in Southeast Asia, however, reached 100.7 million units, a slight downtick from 101.3 million in 2016. Apple remains a relevant player in the regional scene but has seen its market share dip from 4.5 percent in 2016 to 4.4 percent in 2017. Why are Chinese smartphones popular? In the early half of the decade, the global smartphone scene was mostly a competition between Apple and Samsung. However, over the years, Chinese Android smartphone players have entered the game – offering entry level phones at affordable prices. This became a primary pull factor especially for those living in rural China who could not afford the hefty price tags on iPhones and Galaxy devices. Brands like OPPO and Vivo offered premium specification phones at budget prices which proved a successful strategy. 2016 saw even urban Chinese consumers racing to swap their phones for these premium-esque devices. However, the boom of such smartphone manufacturers has led to the saturation of the Chinese smartphone market. According to research by Kantar Worldpanel, the Chinese urban market has since matured and the top five brands, Huawei, Apple, Vivo, Oppo and Xiaomi now hold the lion’s share of 91 percent of the market. “Chinese brands like Meizu, LeTV, Coolpad, ZTE, and Lenovo were once on the same trajectory as the likes of Xiaomi, but any momentum they once had has abruptly stopped, with many struggling to get past a 1 percent share,” said Dominic Sunnebo, Global Business Unit Director for Kantar Worldpanel. “Samsung’s performance in China continues to deteriorate, with its share now down to just 2.2 percent of that market,” he added. This has forced Chinese smartphone players to apply a similar strategy in looking beyond their country’s borders and to the next frontier – Southeast Asia. IDC’s research points to a growing trend within Southeast Asia, of more low-end (US$100 to US$200) and midrange (US$200 to US$400) smartphone purchases. Shipments of midrange smartphones driven by the top five manufacturers Oppo, Huawei, Apple, Samsung and Vivo, grew by 53 percent year-on-year. Low-end devices still own the largest market share of 37 percent but midrange phones are fast gaining popularity – making up 27 percent of the total market in 2017 as compared to 17 percent in 2016. OPPO and Vivo are heavily invested in expanding their brand presence – especially in their affordable F and V series respectively – by having celebrity endorsements and loud marketing. Huawei employs a similar tactic and is pushing their midrange Nova series actively. Even Samsung and Apple are expanding their midrange presence via the Galaxy J series – the most popular midrange series in the region – and older iPhone series, mainly the iPhone 5, iPhone SE and iPhone 6. Another reason midrange phones appeal highly to the Southeast Asian demography is due to consumer attitude towards smartphones. “Apart from the growing popularity of the top-4 players (Samsung, OPPO, Vivo and Huawei) that have been able to hold up shipment volumes, the majority of end-users are in no rush to acquire a new handset if they have been using midrange ones as the handsets are of decent quality and priced considerably high for this budget conscious region, resulting in longer lifecycles and replacement rates,” said Jensen Ooi, Senior Market Analyst, Client Devices, IDC ASEAN. 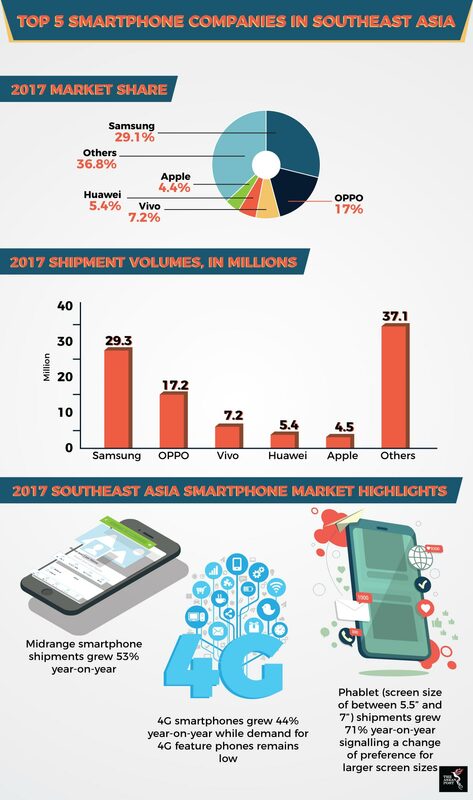 As China’s smartphone market shrinks and manufacturers look towards Southeast Asia to expand, Chinese smartphones will continue being the number one choice for consumers. Simply put, in purchasing these devices, consumers will be getting the most bang for their buck. So, if one thing is evident, Chinese smartphones are here to stay.